For several weeks, Labour has been embroiled in a very public row over how it handles accusations of antisemitism among its members and supporters. We’ve seen lots of commentators on Twitter seeking to defend Labour by highlighting parts of the Antisemitism Barometer, a 2017 report by the Campaign Against Antisemitism working in conjunction with pollsters YouGov. Some sections of the report suggest that antisemitism is more of a problem among parties on the right of politics. 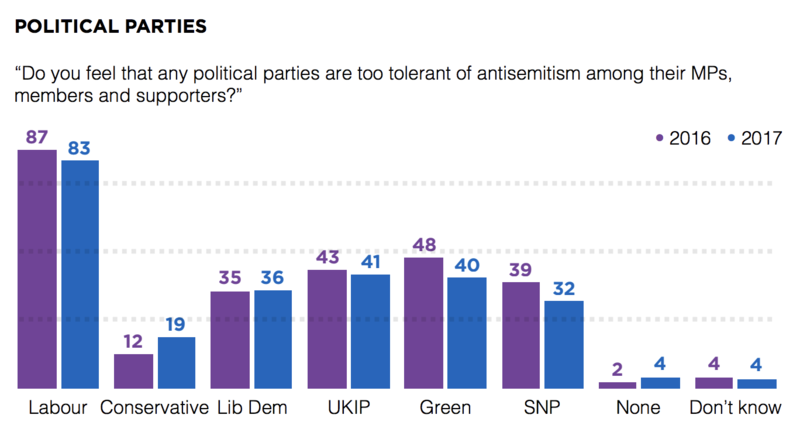 The Antisemitism Barometer: what do party supporters think? 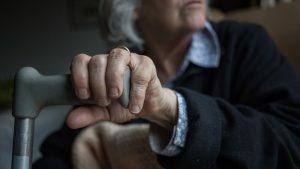 The report’s findings are based on a representative sample of 1,614 British adults, who were asked for their views on seven statements about Jewish people. Respondents were also asked about their political affiliations. Combining those two sets of data allowed the report’s authors to produce the following graph, which we’ve seen doing the rounds on Twitter as Labour’s antisemitism debate rumbles on. The graph suggests that 32 per cent of Labour supporters agreed with one of the antisemitic statements they were presented with. That’s somewhat lower than Conservative supporters (40 per cent). Among the political parties, Liberal Democrats are least likely to agree with an antisemitic statement (30 per cent). How do British Jewish people perceive antisemitism in the parties? Many Labour supporters have been keen to point to the favourable findings of the Antisemitism Barometer report. What’s been less well-publicised is data from the same study that shows how British Jewish people themselves perceive antisemitism in the parties. Why do British Jewish people believe Labour is bad at dealing with antisemitism? Labour party supporters are slightly less likely to agree with antisemitic statements than Conservative voters, so why do so many British Jewish people think Labour is soft on the issue? That’s entirely plausible, but we’d need more detailed polling questions to test the theory. 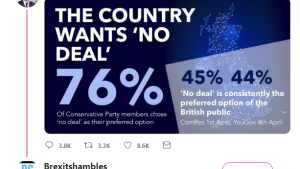 An alternative explanation is that British Jewish people are more likely to vote for the Conservatives, and might have a less favourable view of Labour as a result. 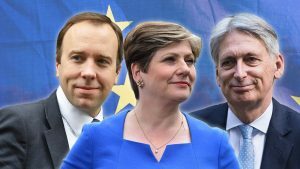 Analysis of the British Election Study results – the gold standard of UK polling data – shows that 63 per cent of British Jews voted for the Conservatives in 2017, while just 26 per cent said they voted Labour. But that raises a chicken-and-egg question: are British Jews more likely to accuse Labour of tolerating antisemitism because they are Conservatives themselves, or are they Conservatives precisely because they perceive Labour to be soft on antisemitism? Can the Antisemitism Barometer be trusted? Despite what some corners of the Twittersphere would have you think, we should be careful of relying too heavily on just one study. As the researchers themselves point out, the sampling of British Jews was was modelled on the National Jewish Community Survey (NJCS) and was therefore self-selecting. The people taking part in the study might be naturally more inclined to express strong opinions on either side of the debate. Put another way: if you don’t feel strongly about the issue, you’re less likely to take part in a survey. And the poll of the wider British population has its limits too. Remember, the respondents were presented with a series of antisemitic statements and asked whether they agreed with them. Given the sensitive nature of the study, this is exactly the kind of survey where “social acceptability bias” is a risk. People may be reluctant to say that they agree with a statement that is antisemitic, even if it reflects what they actually believe. So the results may underestimate the true extent of antisemitism in the UK and among different political groups. Some commentators in the Labour antisemitism row have cherry-picked data from the “Antisemitism Barometer” – a study of attitudes to and among British Jews. 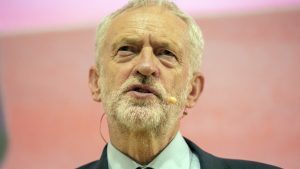 Those seeking to defend the party have focused on the finding that Labour voters are slightly less likely than Conservatives to endorse an antisemitic statement (32 per cent of Labour supporters, versus 40 per cent of Conservative supporters). But the same study also found that the vast majority (83 per cent) of British Jewish people surveyed believe that Labour is too tolerant of antisemitism in its ranks. It’s possible that antipathy to Labour is partly caused by the fact that British Jewish people are more likely to vote Conservative. But it’s important to ask the question: do British Jewish people vote Conservative because they think Labour is too tolerant of antisemitism? We can’t say for certain either way. As ever, we should avoid drawing too many firm conclusions from just one study. It’s possible that this report underestimates the true extent of antisemitism in the UK because people are often reluctant to own up to views they think are unacceptable in wider society. 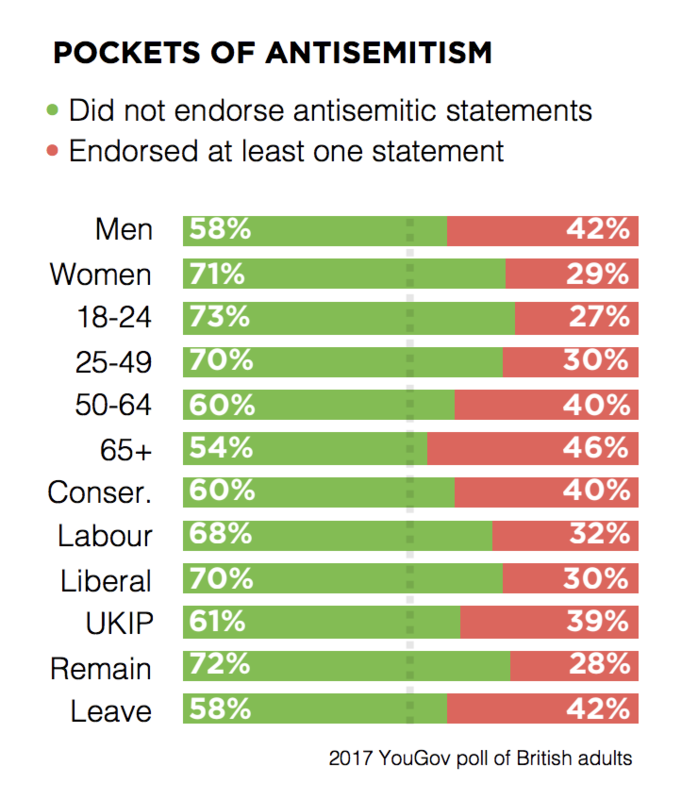 Update: An earlier version of this article suggested that UKIP supporters were the most likely to endorse an antisemitic statement, according to the Antisemitism Barometer. They are actually the second most likely party political group, according to that study.